Belle Zeller, Professional Staff Congress (PSC) president, can be seen at the right with Israel Kugler, the union's deputy president standing at the back. 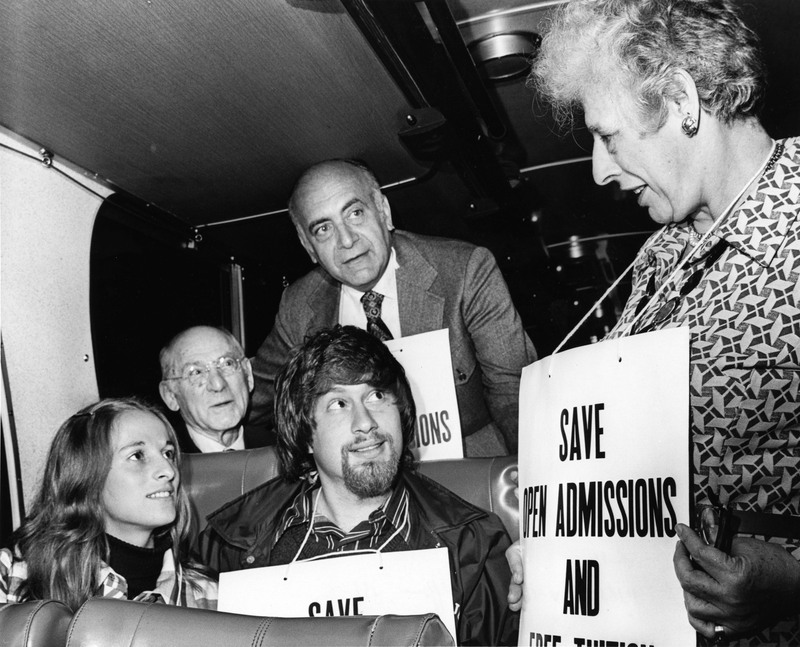 The photo was taken on a bus trip to Albany to rally in support of Open Admissions. The PSC opposed cuts to the program's funding and also favored CUNY's continuation of free tuition. While Open Admissions would survive the decade, free tuition would come to an end in 1976 during New York City's fiscal crisis. From its earliest years, the PSC was a strong force in Albany, thanks not only to the persistence of its lobbyists but also because of support received from the newly merged New York State United Teachers, a group representing educators throughout New York State. Cite This document | Unknown, “Bus Ride to Albany Rally,” CUNY Digital History Archive, accessed April 18, 2019, http://cdha.cuny.edu/items/show/3432.